My love for aviation started at an early age. Being fascinated by everything that flies or flew I started reading books and magazines and building scalemodels of military aircraft. In 1991, at the age of 20, the whole thing became more intense and my love affair with Eastern Europe started that same year. Since then I have travelled many times to the Eastern countries in Europe. I had the chance of visiting many airbases in this part of Europe to document the changes that are taking place. A number of my articles, newsitems and/or photos on this subject have been published in American, Australian, British, Bulgarian, Danish, Dutch and Romanian books and magazines. It is not just aviation that attracts me to these countries but also the people, atmosphere, food, scenery etc etc. Although 'Eastern Europe' is a generally accepted term beware! There are many differences between the various countries in the eastern part of Europe! Of course the subject of this website doesn't imply that I am not interested in other airforces as well! I have a healthy appetite for anything concerning military aviation around the globe. Having had the opportunity of flying a number of different aircraft in both the East and West including the F-16 Fighting Falcon I consider myself extremely lucky. 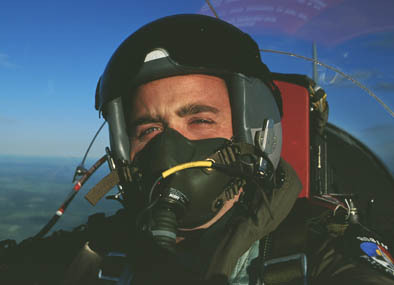 Flying a Canadian Airforce CT-133 (T-33) Silver Star of 417sqn at Cold Lake. I am really not that good with computers so I apologize in advance for any disappointment sustained during surfing through my site. I just learned the basics of building a website and started constructing one. This means that it doesn't look as 'flashy' as some other sites on the web but I think that is not the most important thing. I hope to be able to continue this site and update and expand it regularly with new info and/or pictures. Any info in the form of corrections, additions, advice or constructive criticism is warmly welcomed. All pictures on this site were taken with Nikon cameras (F70, F801 and F5) fitted with Nikkor lenses (and the odd Sigma lense) while film used was Fujichrome Velvia 50 mostly.